PlexBright Compact LED Modules provide the same performance as the PlexBright Table-top LED Modules, only in an ultra light-weight and miniaturized package designed to be mounted to either of our PlexBright Commutators that deliver power to the LEDs as they spin freely along with a behaving animal. These modules have recently been enhanced to feature a magnetic connection to the commutator. The new style of magnetic attachment enables faster module interchangeability. These Compact LED Modules are compatible with the PlexBright Dual LED Commutator, PlexBright Dual LED + 16 Channel Commutator for simultaneous neural recording with analog headstages, or the NEW Carousel™ Commutator for simultaneous neural recording with digital headstages. 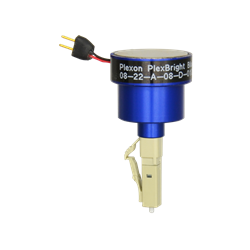 PlexBright LED Modules come in a wide range of wavelengths and are capable of emitting continuous, stable, and quick-responding light through the tip of a 200µm core, custom developed optical fiber. PlexBright LED Modules are available in the following ten wavelengths: Royal (450nm), Blue (465nm), Green (525nm), NEW Lime (550nm), Yellow (590nm), Orange (620nm), Red (630nm) Crimson (660nm), Infrared 1 (850nm) and Infrared 2 (940nm). Integrated Optogenetics System for Bussey-Saksida Touch Screen Systems that provide two channels in each of two animals with TTL control.